There are common myths when it comes to men’s jewelry. One myth we could do without is that bracelets won’t stand up to the wear and tear of a man’s demanding daily life. 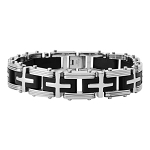 Men’s jewelry is alive and thriving, and we’re proud to offer the widest selection of men’s stainless steel bracelets found online. 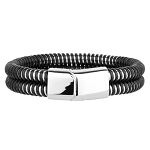 If you’re looking for robust stainless steel bracelets for men, you’ve come to the right place. 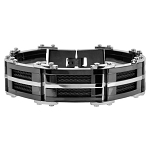 Our collection of men’s stainless steel bracelets features PVD coating, overlapping rubber detail, link bracelet styles, ion plating accents, ornamental centerpieces, and so much more. As if you don’t have enough variety already, we offer two-toned stainless steel to complement any ensemble. If you thought bracelets couldn’t keep up with your active lifestyle, think again. Our selection includes stainless steel biker bracelets for intense workouts on the bicycle trails or to pair perfectly with any casual outfit. Our collection also features rustic accents, for men that gravitate toward deep tones and alternative accent materials to pair with their stainless steel. Explore our silicone and leather bracelet options to discover how we’ve found ways to incorporate stainless steel into every style imaginable. If your style is a little more alternative or grunge, we know you’ll find a lot to like in our variety of skull, chain, and braided leather bracelet products. We want to help you find the perfect bracelet to match your lifestyle. 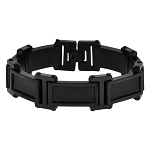 JustMensRings.com is here to help you every step of the way toward finding your ideal wristwear and accessories. Don’t sacrifice style just because you think you can’t have it all. 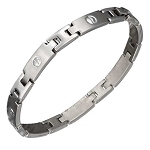 Browse our collection of stainless steel bracelets for men and we think you’ll be pleasantly surprised by the jewelry solutions we’ve come up with to cater to every man’s wish list.